The TARDIS somehow manages to materialise INSIDE a planet, but before the Doctor and Romana have time to work out the hows and whys, they are swallowed by a giant burrowing machine. It turns out the inhabitants of this planet have been forced to live underground, in giant Drill Towns, which are essentially monstrous ships with drills at the bow in which they roam beneath the surface, burrowing for minerals and anything else of use. Of course though, nothing is simple in the world of Doctor Who, there is also something else lurking beneath the planet's surface - and that is the Silex.......and they are hunting! Let me start by saying I loved Subterranea. On paper it should be just a simple, straight forward Who story. The TARDIS arrives on a strange planet, there are new aliens. The Doctor and Romana are quickly split up, and must work locally with different factions to overthrow a massive threat. You get the idea. Perhaps it's that very simplicity of the story that adds to it's appeal. That said, Jonathan Morris injects some fantastic twists into the narrative that lifts the events way above run of the mill, and truly makes them sparkle. The inhabitants of this planet are mole like people, who to prove how industrious they are speak with northern accents (well, why not? - every planet has a north!). The tech is all very steam punk, evoking a very Victorian time period, and the characters are all very reminiscent of those to be found in a cracking Dickens novel (with names like Maxwell Wilberforce Bell and Jericho Wigg, this does get hammered home somewhat). BUT this world is so believable, which is simply down to top notch writing and a cast that seem to gel perfectly. The only slight issue with the story is that the treat is very familiar. The Silex are a scavenger cyborg race, somewhat more reminiscent of Star Trek's The Borg, more than our very own Cybermen. The solution to defeating them is, to be honest, a bit mundane (imagine a hive mind running on....shortwave radio), but again, it's about the overall journey. Which is a true joy. For me, this story reminded me of The The Crimson Horror, crossed with The Robots of Death (there are some great sound effects used for the Drill Towns, that will instantly put the listener in mind of a sand miner in Robots of Death) all of that AND a smattering of a certain Jules Verne classic. In my book, not one of those influences is a bad thing at all. As mentioned, the cast are stellar. Tom Baker and Lalla Ward are effortless at evoking Tom's final season, and as always gel together perfectly. The stand out of the supporting cast has to be Matthew Cottle (probably best known for the '90s sitcom Game On) as Maxwell Wilberforce Bell, a jobs worth of a character, who is very proud of his Drill Town, and very much devoted to his wife. Bell's character also provides a fair bit of comic relief to the proceedings. Among the others we have stage and television character actress Abigail McKern, who gives a suitably duplicitous performance as Bell's wife Lucretia. We also have Big Finish stalwarts Robbie Stevens as Mr Jelicho Wigg, and Jane Slavin as the heroic Arabella Wagstaff. 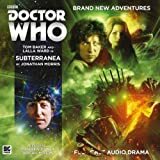 Subterranea is available now as a digital download, or audio CD from Big Finish. Hurt clearly enjoyed doing drama on audio; he could project his wonderful voice and deliver some great oratory. Indeed, in an interview with BF supremo Nick Briggs (that is available as part of a tribute podcast that BF released not long after his death), Hurt talked about the advantages of radio drama over television and the theatre. “I love sound for a start,” he told Briggs. “I’ve always enjoyed voice work, I’ve always enjoyed doing radio, I think, because it’s very akin to film and less akin to stage … You can cut between this time, that time … You can play with it the same way you can in film but it’s more immediate. You have to have a sensibility for it, you have to hear it in your head, you have to know what your voice is sounding like and how it comes across.” There is no doubt that Hurt was in his element in The War Doctor saga and in BF’s adaptation of HG Wells’ The Invisible Man. Despite Hurt’s dedication to his art, Casualties of War won’t ever be a tour de force, nor is it the best of BF’s four War Doctor volumes. However, it would be unfair to judge it too harshly in the context of Hurt’s passing. It is an entertaining collection, and it brings The War Doctor saga to a satisfactory, if somewhat predictable close. Just as the titles of the last couple of box sets reflected loose themes – eg the lengths to which Daleks and Time Lords alike would go to find an edge in Infernal Devices, and the machinations of third parties in Agents of Chaos – so Casualties of War explores the impact of the Time War on worlds, societies and even other realities unlucky enough to be caught in the crossfire. 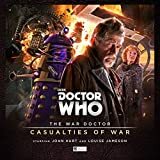 The war’s effects through time have been explored in other Doctor Who audios (notably the Eighth Doctor serial The Sontaran Ordeal) but this box set does a sterling job of putting the Time Lords, the Daleks and the listeners on the front line. Pretty Lies, the first of Volume 4’s tales, largely resumes from where Vol 3 concluded, with the Doctor and Time Lord War Council strategist Cardinal Ollistra (Jacqueline Pearce) on the run from the Daleks. In some respects, the story setting is reminiscent of an old Western – as a couple of strangers “mosey” into an isolated township on a remote frontier planet and inadvertently defend it against marauders. After crash landing on Beltox, the Doctor and Ollistra meet Schandel (Joseph Kloska), a time-travelling war correspondent. 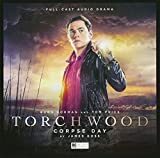 Schandel, with the aid of an AI conveniently called Editor (Mark Elstob), has anticipated their arrival and is aware of their roles in an impending Dalek attack on the human township of Fairgill. Reluctantly the Doctor and Ollistra must use their wits and Fairgill’s scant resources to buy themselves time and save as many lives as possible against an all-out Dalek assault. There is no doubt that scribe Guy Adams has based Schandel on a variety of Doctor Who fans he’s met but he doesn’t let the character get too out of control. Adams uses Schandel to show, much to the Doctor’s chagrin, how truth can indeed be one of the first casualties of war and how the camera can sanitise war for the sake of entertainment. Indeed, the Doctor is horrified when his words are edited and presented in a context that make him out to be a hero (the one thing he insists he’s not). Adams devises a clever ruse at the climax which also ties in with his underlying commentary on the wartime role of the media. It’s not necessarily an original climax (indeed it’s very reminiscent of a ruse used to fool Pearce’s former persona Servalan in the Blake’s 7 TV episode The Harvest of Kairos) but it’s effective and dramatic. The second instalment, The Lady of Obsidian, sees the War Doctor and Cardinal Ollistra again on the front lines of the Time War, as the Time Lords make a stand at the planet Grend. While Ollistra seeks to amass a Gallifreyan time fleet to head off an impending Dalek strike force, the Doctor goes in search of the mysterious “Lady of Obsidian” to recruit her guerrilla faction which is attacking Dalek forces in the sector. It isn’t long before the Doctor realises the so-called “Lady” is in fact his former companion Leela (Louise Jameson). But this is a very changed Leela from the “savage” we knew in the classic era of Doctor Who and indeed in BF’s Gallifrey spin-off series. Her psyche has been scarred – both figuratively and literally – by the Time War. 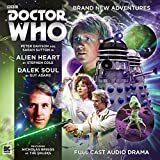 While Leela’s affliction – a “time wound” – is not entirely convincing to the listener (anyone else in her position would probably be driven mad by the condition), Louise Jameson turns in a persuasively tortured, anguished, confused and uncertain portrayal. In the subsequent tale, once restored of her faculties, Jameson portrays the naïve, instinctive and curious huntress that we’ve loved for more than 40 years. In the 2009-10 two-parter The End of Time, the Tenth Doctor spoke of other factions joining the Time War, including the “Could’ve Been King and his army of Meanwhiles and Neverweres”. Lady of Obsidian writer Andrew Smith delivers a variation on this one-off line, creating the Unlived, hostile beings from a rift in the space/time continuum. While the Unlived, led by the Gollum-like Skaul (Chris Porter), are described by Leela as an even greater threat than the Daleks, they are for the most part unconvincing and one-dimensional. It could be argued the Unlived are meant to be vague beings but that shouldn’t make them caricatures as well. Just as Pretty Lies borrows ideas from the Western trope, so The Lady of Obsidian draws heavily from space opera influences, notably Star Wars and Star Trek. This is evident in the dogfights in space between Dalek saucers and Battle TARDISes, the Doctor’s recruitment of a cocky former soldier-turned-smuggler, a guerrilla group that hides deep in a nebula (not unlike the Maquis in the Trek spin-off Deep Space Nine) and an “evil galactic empire” (the Daleks) intent on crushing all “non-Dalek life”. Briggs – who again voices the Daleks, including their deep-throated Time Strategist – quite rightfully resists the temptation to end The War Doctor saga on a space opera tour de force. Instead, he delivers a script that is quite surreal, ethereal and (excuse the pun) enigmatic – but definitely not to the extent that the listener loses track of the story. Indeed, some of John Hurt’s best work inevitably comes to the fore in The Enigma Dimension, particularly in the climactic confrontation with the Time Strategist. Hurt’s performance is no doubt bolstered by close friend Jacqueline Pearce as Ollistra. As a reluctant sidekick or “helper” (her word for the Doctor’s erstwhile companions over many centuries), the cardinal is the perfect foil for the jaded, cranky War Doctor. No doubt due to her recent travels with the Doctor in Volumes 3 and 4, the character’s disposition has softened since she was first introduced in Only the Monstrous. She even shows signs of altruism. Ollistra passes off defending Grend as being a strategic advantage for Gallifrey that “by a pleasant coincidence … also happens to be the right thing to do”. However, she is also clearly shaken and emboldened enough by Beltox’s fate at the end of the Fairgill engagement to ensure that the Daleks do not repeat their atrocities in the Grend system. Ollistra’s ruthless, calculating streak really comes to the fore in the climax to The Enigma Dimension when, to the Doctor’s disgust, she seizes an opportunity to ultimately turn the Time War in the Time Lords’ favour. Again, Pearce’s performance cannot help but be compared to her Blake’s 7 alter ego Servalan; regardless she is an outstanding actor. And while this volume has debunked my theory (first postulated in my review of Vol 2) that “the unhappy woman” (as Leela cheekily calls Ollistra) is not a Time War incarnation of former companion Romana, it is great that Pearce’s Ollistra will continue to be a foil in the forthcoming The Eighth Doctor – The Time War series. Aside from Hurt, Pearce and Jameson’s outstanding performances, Volume 4 of The War Doctor saga again provides great performances from some of Big Finish’s lesser known artistes – in particular, Julia Hills as Fairgill’s governor Sera and Lizzy Roper as smuggler Rosata Laxter – as well as excellent sound effects and incidental music from Howard Carter. In The Enigma Dimension, Carter’s blending of the iconic Dalek throbbing sound effect (which dates back to the pepperpots’ very first TV appearance in 1963-4) with the incidental track is particularly inspired and foreboding. It’s a masterstroke that Murray Gold has not even attempted in the modern TV series. Perhaps I do fear ... Perhaps I do but not you yourselves. I fear what you can do. Yes, I fear that – the death, the pain, the suffering, the merciless, senseless destruction of … well, everything that isn’t you! Yes, I do fear that. But as for you, the Daleks fear powerlessness, defeat and in everything and everyone you ever encounter, you see your fear staring right back at you! We Time Lords have fought too long and too hard to be anything other than warriors … If the Daleks alone were to be destroyed, I think we would find someone else to fight now! I think that’s my real fear – that the war will never end! Sadly, with Hurt’s passing, such wonderful monologues and dialogue is gone forever. It can only be hoped the great man’s departure doesn’t entirely close the door on the War Doctor’s adventures. BF has announced that the next four volumes of the Eighth Doctor’s adventures will focus on the beginnings of the Time War, which should compensate for the vacuum The War Doctor series leaves. However, why couldn’t there be more volumes of The War Doctor in the long-term? Yes, John Hurt won’t be there, but the absences of the actors to play the first three Doctors and Christopher Eccleston’s self-imposed exile from all things Who have not stopped BF delivering further adventures for each of those incarnations. Hurt’s Doctor shouldn’t be an exception, particularly as Ollistra, Leela and Veklin (Beth Chalmers, who appeared in Vol 1 and also makes a cameo in Vol 4) could all play parts in future narratives. Hurt’s passing need not entirely mark the end of what has been a great series – and what better tribute could there be than to continue the adventures of a character whose artiste was so beloved by generations of viewers and who will even be long remembered by some Doctor Who fans as the noblest Doctor of them all?